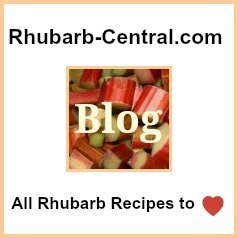 By keeping an eye on my Blog, you will never miss the latest Rhubarb Recipes, Growing Information and Tips. To subscribe to my Blog, (no email necessary), right-click on the orange RSS button above, and then paste the URL into your RSS reader. 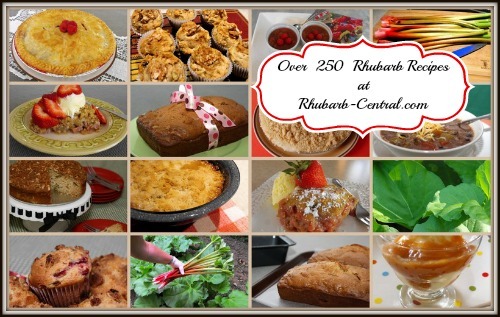 Why not "Like" my "Rhubarb Recipes at Rhubarb Central" Facebook Page - see right-hand column (or scroll down for mobile view), and receive updates that way! 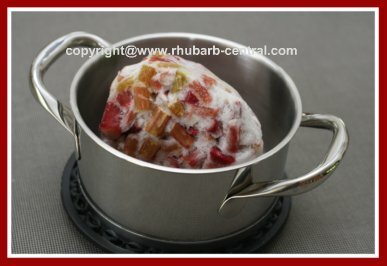 Stewed Rhubarb Recipe - Here is How to Prepare Rhubarb on the stove using Fresh OR Frozen Rhubarb for a side dish or a delectable topping! This is my FAVORITE RHUBARB RECIPE! 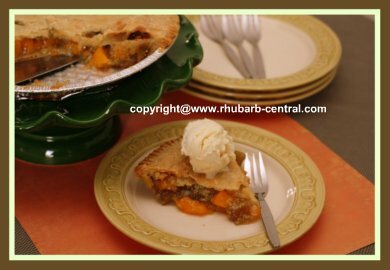 Continue reading "Stewed Rhubarb Recipe - How to Prepare Rhubarb on the Stovetop"
Here at the Lil' RHUBARB SHOP, you can buy frozen rhubarb, rhubarb seeds and rhubarb plants, rhubarb jams, fillings, medicinal rhubarb products and more -- all at Rhubarb-Central.com! 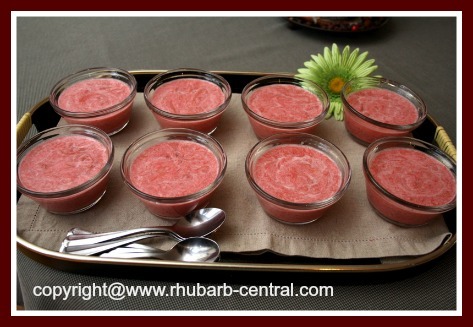 Continue reading "At Lil' Rhubarb Shop BUY Frozen Rhubarb-Plants-Seed-Rhubarb Jam, more!" These Spring RHUBARB EASTER RECIPES with PICTURES are great ideas for what to make using your rhubarb for Easter Brunch, Dinner and Dessert. Continue reading "Spring Rhubarb Easter Recipes For Brunch, Dinner and Dessert"
Here are two RHUBARB SMOOTHIE RECIPES, a Rhubarb Yogurt Smoothie, and a Rhubarb Milkshake Smoothie with any Berries and stewed rhubarb sauce made with fresh or frozen rhubarb. Continue reading "Healthy Rhubarb Smoothie Recipes with Rhubarb and Yogurt or Milk"
Try this Healthy Banana Rhubarb Muffin Recipe using fresh OR frozen rhubarb; they make a great rhubarb snack idea, or breakfast /brunch rhubarb treat. 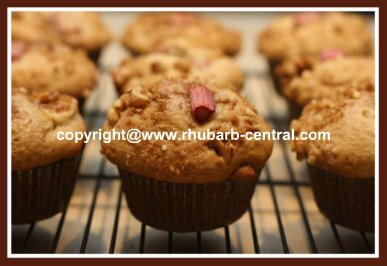 Continue reading "Banana Rhubarb Muffin Recipe - Healthy Muffin Recipe"
Looking for Christmas Recipes with Rhubarb? Here are Fun and Unique Rhubarb Christmas Recipes to make with fresh or frozen RHUBARB, for the Best Holiday Breakfast, Brunch, Punch, Dinner and Dessert ideas. 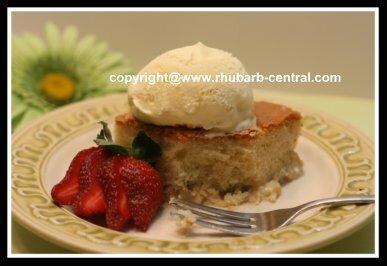 Continue reading "Rhubarb Christmas Recipes with Rhubarb - Dinner Dessert Baked Goods"
This Recipe for a Strawberry Rhubarb Cake Recipe makes an amazing Rhubarb Tea Cake or a Coffeecake with fresh rhubarb and strawberry gelatin/Jello. Continue reading "Strawberry Rhubarb Cake Recipe - Fresh Rhubarb Cake with Jello/Gelatin"
These RHUBARB SALAD RECIPES and rhubarb dressings will compliment any meal as a refreshing rhubarb side dish made with stewed or sauteed rhubarb, or jello, and fruits or veggies. 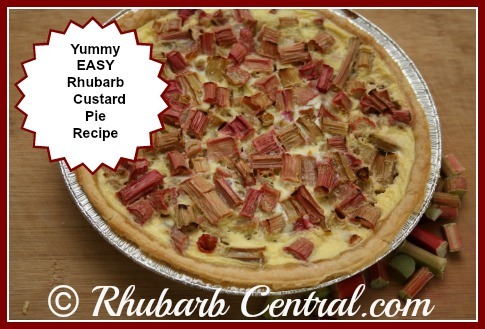 Continue reading "Rhubarb Salad Recipes - Easy Salad Recipes with Rhubarb"
This Easy Rhubarb Cake Recipe uses a Purchased /Boxed Cake Mix and fresh rhubarb to make a quick cake for snack or dessert. 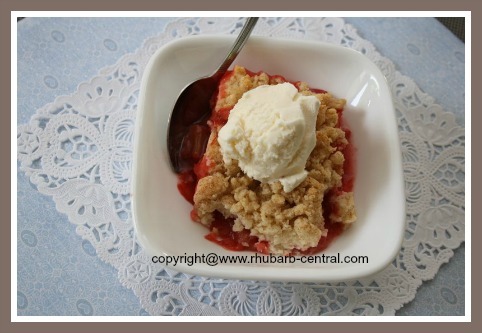 Continue reading "Easy Rhubarb Cake Recipe - With Boxed Cake Mix and Fresh Rhubarb"
This Caramel Rhubarb Cobbler Recipe is an Old-Fashioned Rhubarb Recipe for a Scrumptious Rhubarb Dessert just like Grandma used to make! You need about 5 1/2 cups chopped fresh OR frozen rhubarb to make this yummy Rhubarb Recipe! Continue reading "Caramel Rhubarb Cobbler Recipe -Old-Fashioned Dessert -Like Grandmas'"
This Homemade Rhubarb Wine Recipe makes a great sweet or dry rhubarb wine using 10 - 12 cups of sliced rhubarb and a home brewing kit. Continue reading "Best Homemade Rhubarb Wine Recipe - How to Make Rhubarb Wine"
Best Rhubarb Recipes, over 250 Easy Recipes for Rhubarb with Pictures for pies, crumbles, crisps, cakes, rhubarb desserts, sauces, how to can and freeze rhubarb and more! 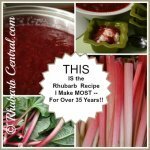 A website devoted to EVERYTHING rhubarb! Continue reading "Rhubarb Recipes - Best Ideas for Recipes to make with Rhubarb"
FROZEN Rhubarb Recipes and advice about using frozen rhubarb instead of fresh rhubarb in a rhubarb baking or cooking recipe. Here is what to do when using frozen rhubarb from your freezer. 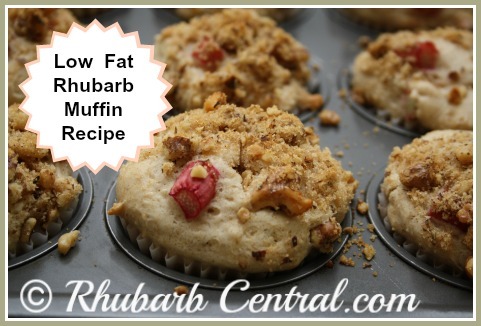 Continue reading "Frozen Rhubarb -Can you use Frozen instead of Fresh Rhubarb in Recipes"
This APPLE RHUBARB MUFFINS Recipe makes delicious moist Muffins from scratch using about 1 cup chopped apples and 1 cup fresh or frozen chopped rhubarb. Continue reading "Apple Rhubarb Muffins Recipe - Delicious Moist Muffins from Scratch"
This Easy Rhubarb Custard Pie Recipe is a basic custard pie using 3 cups of chopped fresh rhubarb and milk. I made this using a purchased Tenderflake Pie Shell, you can use a purchased or a homemade crust for this rhubarb custard pie. Continue reading "Easy Rhubarb Custard Pie Recipe - Using Homemade or Purchased Crust"
This Rhubarb Cream Pudding Recipe WITH PICTURES is a great idea for the very easiest rhubarb dessert to make if you are looking for a rhubarb recipe using freezer or fresh rhubarb you need about 4 cups of chopped rhubarb to make this rhubarb dessert recipe. Continue reading "Rhubarb Cream Pudding Recipe - Easiest Rhubarb Dessert Idea"
This Rhubarbsicle Recipe makes the perfect rhubarb snack recipe for kids; who can resist these tasty frozen rhubarb popsicle treats? 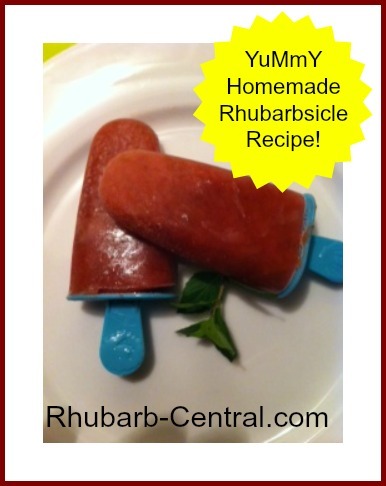 Continue reading "Rhubarbsicle Recipe - Perfect Rhubarb Popsicle Recipe for Kids "
This EASY to MAKE Peach Rhubarb Pie Recipe includes sliced canned peaches in the filling and fresh or frozen rhubarb for an amazing combination! I made this pie using purchased pie crusts - one for the top and one for the base! Continue reading "Peach Rhubarb Pie Recipe - Using Frozen or Fresh Rhubarb and Peaches"
This Low Fat Rhubarb Muffin Recipe makes yummy homemade Rhubarb Streusel Muffins with fresh or frozen rhubarb, whole wheat and all-purpose flour, buttermilk, walnuts and low fat Becel margarine! Continue reading "Low Fat Rhubarb Muffin Recipe - Made with Becel Margarine"
This Easy to Make RASPBERRY RHUBARB JAM made with Jello or Gelatin Recipe makes the best freezer jam using fresh or frozen rhubarb and raspberry pie filling has amazing flavor! 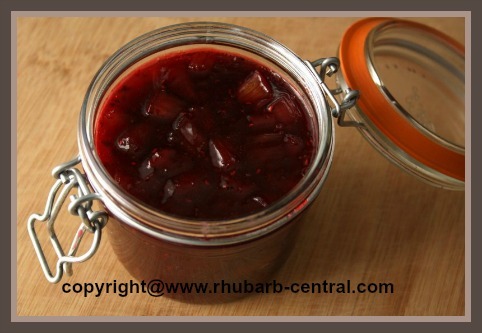 You can make this rhubarb jam is you have 6 cups chopped fresh or frozen rhubarb on hand. Continue reading "Raspberry Rhubarb Jam with Jello /Gelatin Recipe - Rhubarb Freezer Jam"